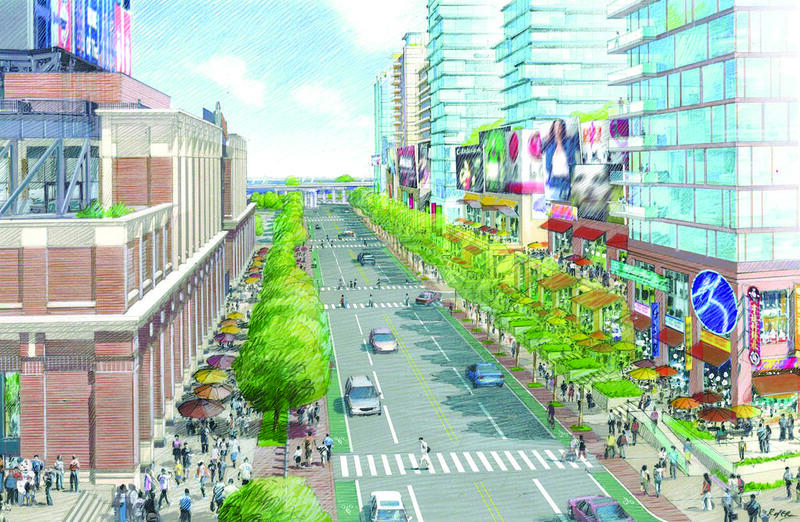 When former mayor Michael Bloomberg unveiled the city’s master plan for redeveloping Willets Point back in 2007, the real estate boom in nearby Flushing had barely started, and David Wright was the center of attention at Shea Stadium. Fast-forward 12 years, and a new version of that plan is just now beginning to take shape. After years of legal battles and delays, the city struck a deal with the Related Companies and Sterling Equities last year to develop six acres at Willets Point Boulevard and Roosevelt Avenue with 1,000-plus affordable apartments, a 450-seat public elementary school and open space. The city’s Economic Development Corporation then released two proposals for the project’s second phase this January. One calls for a soccer stadium with up to 25,000 seats, along with additional retail space, new police and fire stations, a public high school and a mixed-income rental building. The other calls for six blocks of residential development, a health center, a public high school, retail, open space and a fire station. The heavily industrial spot may also be seeing a new level of investor interest thanks, partly, to the federal Opportunity Zone program. 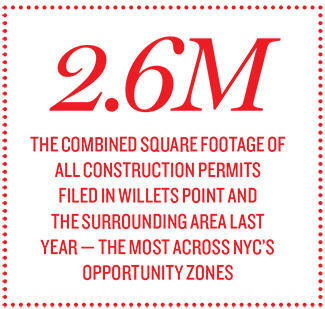 Willets Point and the surrounding area saw the greatest amount of combined space among all construction permits filed within the city’s OZ census tracts in 2018, at roughly 2.6 million square feet, a recent analysis by The Real Deal found. But since the neighborhood’s redevelopment has taken more than a decade to get going, some New York real estate players remain skeptical about what will come. The billion-dollar-plus question is whether Willets Point, also known as “the Iron Triangle,” is actually on the cusp of joining the wave of development that has taken place in so many other parts of the city. Apart from Related and Sterling’s sprawling project, most other big developments in the area are located across the creek in Flushing — F&T Group’s Tangram condo project and a pair of mixed-use residential towers from Andy Chau’s Wing Fung Realty Group among them. Stephen Preuss, an investment sales broker at Cushman & Wakefield who represents several clients in the area, said that interest in Willets Point remains somewhat speculative, with many investors adopting an “I’ll believe it when I see it” mentality about the latest redevelopment push. Despite the redevelopment plan’s checkered past, the latest iteration has been proceeding without a hitch, and work on the first phase has already started, EDC officials say. Local City Council member Francisco Moya also maintained that the project is finally on the right track and said he’s “very confident” it will all come together. The revised plan’s stronger emphasis on affordable housing has made it easier to move forward, he added. Michael Wang, a broker at Little Neck-based Politan Real Estate, said he doubts more big-name sponsors will flock to Willets Point without a better sense of what the second phase of Related and Sterling’s project will look like. Once that happens, Wang predicted, developers will quickly take a much more active interest in the neighborhood. Cushman’s Preuss is marketing a 137,000-square-foot site in Willets Point that allows for 277,000 as-of-right buildable square feet, which he said makes it the largest assemblage available in northern Queens. Corona-based Fodera Enterprises has owned the four industrial and manufacturing buildings at 129-02 Northern Boulevard since 1974, and Preuss said he hopes to get an offer of around $60 million for the site. 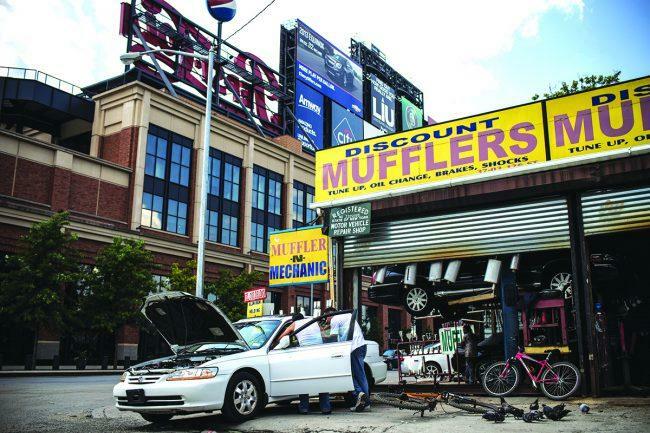 Many owners in Willets Point are stuck on the prices the city was paying in a lot of its eminent domain transactions, according to several people familiar with the previous plan. Bill Seto, president of Flushing-based Fultonex Realty, said the last time it seemed as though Sterling and Related’s project was good to go, many buyers rushed into the neighborhood to scoop up properties near the site. That decision came back to haunt them when the courts put a stop to the plan, and some are wary of making similar moves in 2019. Bloomberg’s original plan for the neighborhood called for more than 5,000 new apartments, 500,000 square feet of office space, 1 million square feet of retail, new parks and playgrounds, a convention center and a hotel. 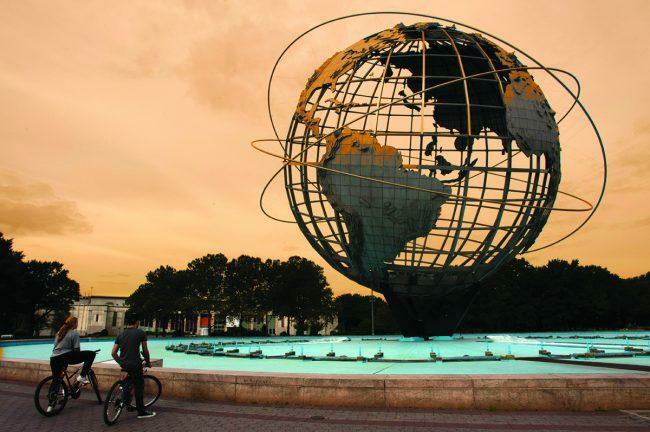 The public approval process started in 2008, and four years later, Bloomberg announced that Sterling and Related’s joint venture, Queens Development Group, would move forward with a plan that also included a controversial giant shopping mall. That plan quickly ran into legal trouble, though, bringing the process to a screeching halt. Former New York State Sen. Tony Avella and a group of automotive businesses that would have been pushed out under eminent domain filed lawsuits against the city over the proposal. The city ultimately settled with the automotive collective in 2015, but Avella’s lawsuit made it all the way to the New York Court of Appeals. He argued that the plan needed approval from the state legislature before it could move forward because the 200-store shopping mall was going to be located on parkland, and the legislature would be required to sign off on any conversion of the green space to other uses. The Court of Appeals agreed with Avella in a 2017 ruling, effectively putting an end to Bloomberg’s plan. Avella, who lost re-election to the state Senate last year, told TRD he does not regret spearheading the lawsuit even though it dragged out the effort to redevelop the neighborhood. F&T’s president, Michael Meyer, said his company took part in the original RFP process to develop the neighborhood years ago, and its proposal included building a bridge over Flushing Creek to provide a more direct link between Willets Point and Flushing. He said that connecting the two neighborhoods remains essential to making sure development in Willets Point lasts beyond the Queens Development Group’s project. Right next door, Flushing has seen a huge development boom in recent years. More than 2,600 condos have hit the market there since 2010, and Flushing is filled with such completed megaprojects as Onex Real Estate Partners’ Sky View Parc and Flushing Commons. 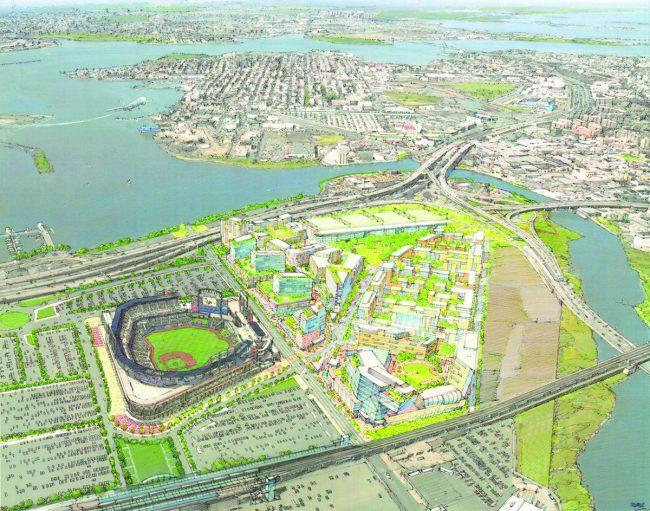 Flushing developer George Xu looks at Willets Point with a similar mix of optimism and caution. The Century Development Group founder said he definitely sees potential in the neighborhood, but he does not feel ready to put his money in Willets Point yet. Xu said that although other Queens developers are paying close attention to Willets Point — especially given its proximity to Flushing — they are largely content watching from across the creek until Related and Sterling’s project wraps. But he argued that virtually any new project that comes to Willets Point would be a marked improvement over what’s in the neighborhood now. “I’d rather have a nice developed area next to Flushing than a junkyard,” Xu said.